Girls saved its biggest twist for next-to-last. The news of Hannah’s pregnancy was surprising, as well as her decision to keep and raise the child in spite of the less-than-ideal circumstances surrounding its conception. “Goodbye Tour” leads with another shocker—Hannah’s been offered a teaching job at an unidentified liberal arts college somewhere upstate, and she’s ready to leave the city behind. But that’s still not the most jaw-dropping revelation of the episode. As it turns out, Shosh has been the smart, well-adjusted one all along, and “Goodbye Tour” sets her up for one hell of a mic drop. Well, maybe “all along” is a bit of an overstatement, but Shoshanna makes clear that all her off-camera soul searching has left her a changed woman. She doesn’t appear until the final third of the episode, when Hannah drops by her place and finds Shosh in the middle of an engagement party Hannah wasn’t invited to. (Yes, Shosh is engaged now. To Byron Long. No big deal.) And man alive, the future Mrs. Byron Long looks radiant. She’s happy, she’s comfortable in her skin, and she’s surrounded by people who love and support her, almost none of whom comprise the Girls four. Shosh can’t be bothered with Hannah’s hurt feelings, which is understandable given that Hannah apparently failed to notify Shosh about her pregnancy. These characters have spent years trying to hold their young friendships together with tape and glue, and only now are they beginning to realize how much they’ve slacked on the maintenance recently. 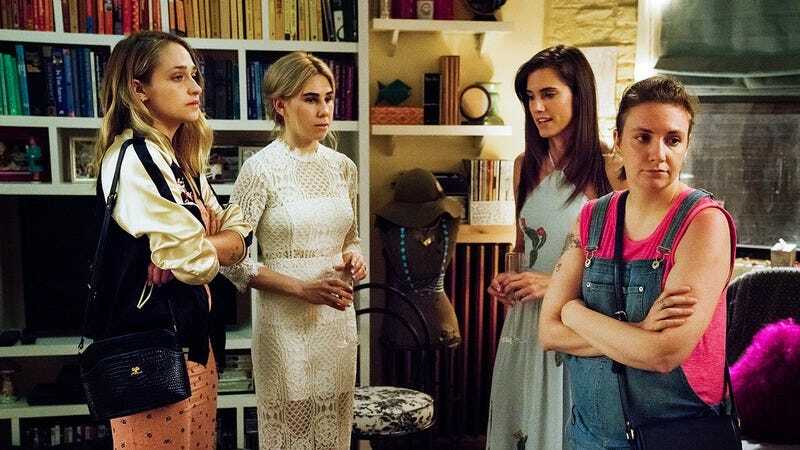 Marnie, the only member of the core four to earn a proper invitation to Shosh’s engagement party, interrupts a scene in the making and insists the four friends convene in the bathroom. That’s when Shosh shows off everything she’s learned, and the other three are left shocked and a little dismayed, but unable to deny the truth Shosh has laid out. Like it or not, they’ve grown apart, and pretending they’re still friends has gotten to be more trouble than it’s worth. The scene echoes the classic confrontation from “Beach House,” but this time, the argument is far less passionate. That was a knockdown fight, but this conversation plays more like a calm arbitration hearing for a divorcing couple. Shosh, Hannah, Marnie, and Jessa are finished fighting with each other and are ready to move on with their lives. Once their friendship was over, the party began. And what a relatable moment, the moment when a relationship goes through a painful but necessary evolution, then suddenly becomes fun again. The collective unburdening allows for breakthroughs that might not have been possible had the characters devoted themselves to maintaining their friendship facade. Jessa’s bitterness toward Hannah has only increased since Adam drove a wedge between them, but now she’s able to apologize for everything and even offer Hannah a dress for the kid. (It’s a boy, for the record, but Hannah didn’t rule out the dress, she just corrected Jessa’s assumption.) Suddenly, nobody cares who was originally invited and what that means. They’re dancing and celebrating their friend, probably for the last time. Hannah takes the dissolution of the friendship pretty well, as she should, considering how she wound up at Shoshanna’s party in the first place. After being offered the job, Hannah tries to call her friends to ask for advice about the huge life choice she’s considering. Elijah isn’t thrilled with the idea of Hannah disappearing into the woods with her baby, but he’s as supportive as he knows how to be. But Marnie is nowhere to be found, and when we finally see her, she’s sending Hannah to voicemail in order to avoid talking about Shosh’s party. Tad and Keith end up giving Hannah the pep talk she needs, a role Marnie once relished if only to let her judgmental side out of its cage. Hannah’s arriving at a point in her life when she has to be much more thoughtful and careful about who she makes part of her support system, and Jessa isn’t the person to call in an emergency. “Goodbye Tour” seems like it’s going to end with the four friends enjoying each other’s company for the first time in a while and the last time for a while. But by the end of the epic closing montage, Hannah has already moved into her new place and is ready to embark on her new life. Marnie is finally free of Desi (knock on wood), back in her mother’s house, and presumably sneaking up on a successful next chapter. Jessa is still kind of selfish and awful but much more willing to admit to it, which is something. Shosh is engaged, for god’s sake. This is what growing up looks like, and Lena Dunham and Jenni Konner should be proud of themselves for having the guts to write an ending that caters to what these characters need, not what the audience wants to see. Surely they’re invited to the wedding though, right? Elijah got the part in White Men Can’t Jump: The Musical, even without getting his dribbling skills up to par. Jessa quit school, which… y’know, is probably for the best. It was nice to see Caroline return briefly to let us know she’s alive and on the right cocktail of brain meds. For now, anyway. I wouldn’t be at all surprised to see Elijah’s dour, a capella rendition of “Cool For The Summer” used in the teaser trailer for a summer blockbuster. Check out this great Newswire about why Shosh has been missing all season.